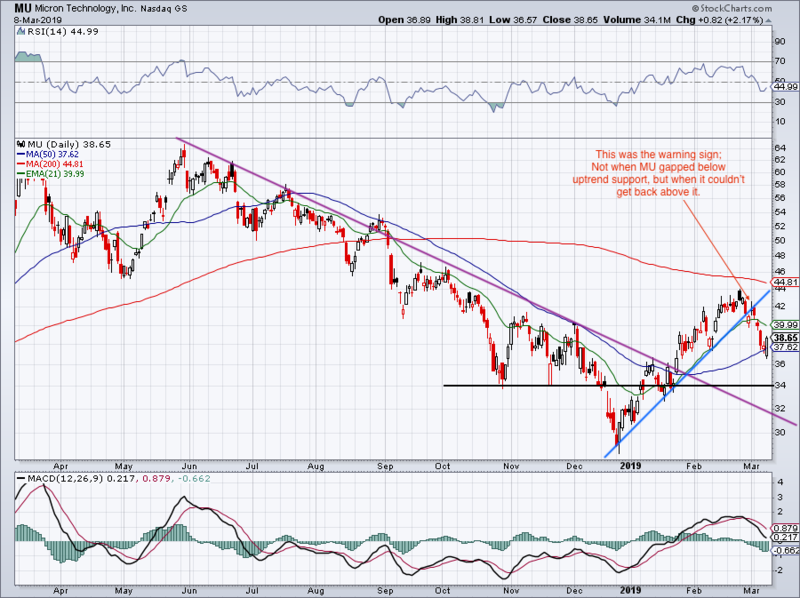 Home / Trading / Is Micron Stock Poised To Make New Lows On Changes To DRAM Chip Outlook? A rally in shares of Micron (NASDAQ:MU) came to a screeching halt last Wednesday after a niche equities research firm cut their numbers for fiscal 2019. MU stock fell 4.6% on the report. We’ll take a closer look at the charts for MU stock in a moment, but on the plus side, shares were able recover a bit and close above the 50-day moving average after opening below this mark on Friday. This showed that bulls still have some control, even if they’re fumbling the ball a bit. What’s the main issue with Micron stock? It’s that seemingly most investors “have one foot out the door.” It’s not unlike Ford (NYSE:F) or General Motors (NYSE:GM) and the rationale is simple: These companies operate in boom-and-bust environments. Micron, Ford and GM do great when their markets are doing great. But when the economy grinds to a halt, the car makers really feel the pinch, just like when memory pricing power erodes for Micron. As such, many investors are a fickle bunch — they are long the name but willing to sell on the first sign that the tides are turning from boom to bust. It’s one reason why these stocks have such incredibly low valuations. When MU stock fell from ~$40 to $37.50 last week (the first test of the 50-day), it came following an analyst warning. Specifically, Cleveland Research’s Chandler Converse said DRAM pricing would likely hurt the company’s full-year revenue. As such, the firm slashed its estimates from $25.5 billion to $24 billion. Weak demand, increased competition and higher inventories are the culprits. This also hit Intel (NASDAQ:INTC) and Western Digital (NASDAQ:WDC). DRAM made up 68% of Micron’s total revenue in the most recent quarter. Management also told investors on the conference call that pricing will be under pressure in the current second quarter. As such, Q2 guidance came in way below expectations, in a range from $5.7 billion to $6.3 billion, below consensus estimates of $7.18 billion. Earnings guidance also came up way short. All of this took place back in December when MU last reported earnings. At a conference last month though, management expressed confidence in the second half, saying demand for DRAM remains healthy but the company is still working through inventory. Even with consensus expectations calling for a 38% decline in full-year earnings, MU stock trades at just 5.7 times this year’s earnings. Let’s try not to get “too cute” with the trade though. While that may happen, the specifics don’t really matter. What matters is which way MU breaks. If the stock stalls and breaks back below the 50-day level, then $34 could be on the table. Bulls will want to see a push above $40 and the 100-day, and retest of prior uptrend support. 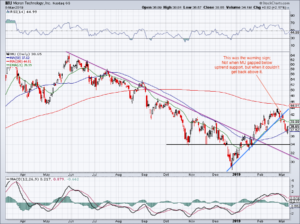 This could push Micron stock to the $44-$45 area. Although MU stock hasn’t been a great earnings performer as of late, investors have already digested a lot of bad news — disappointing results in December and poor guidance — and have rallied since. A strong outlook will go a long way into helping this name. Article printed from InvestorPlace Media, https://investorplace.com/2019/03/is-mu-stock-poised-to-make-new-lows/.